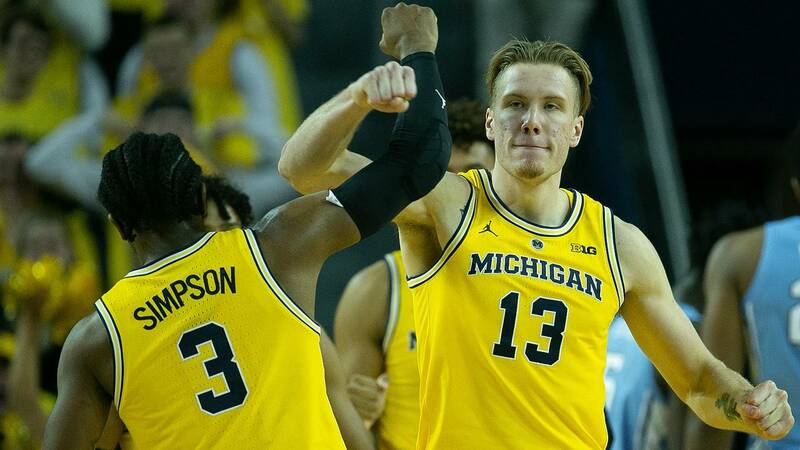 ANN ARBOR, Mich. - The Michigan basketball program got some tough news on the first official day of the off-season as star freshman Ignas Brazdeikis, redshirt junior Charles Matthews and sophomore Jordan Poole have all declared for the NBA draft and will hire agents. 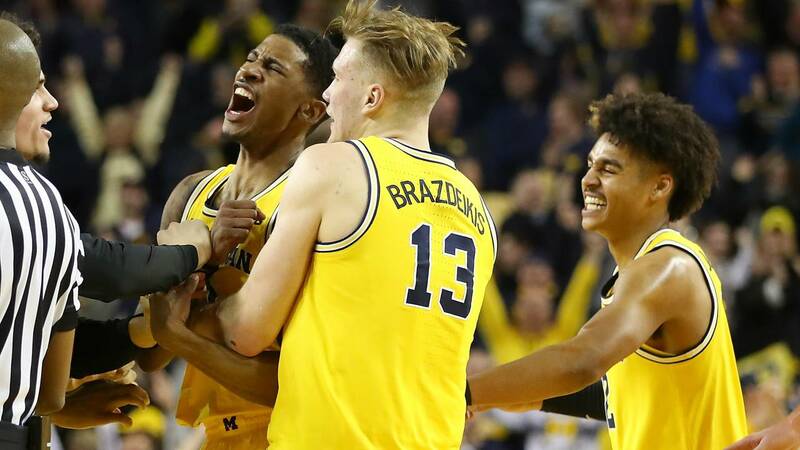 "Charles, Jordan and Iggy have all decided to take the next steps in pursuing their dreams of playing in the NBA," head coach John Beilein said in a release. "The new process is a unique experience and one that my staff and I will assist in every way we can. We want each of them to utilize this opportunity to get more feedback so they can make the best decision possible for themselves and their families. All three are remarkable young men with amazing futures in front on them." ESPN reports Brazdeikis, the Big Ten Freshman of the Year, intends to remain in the draft, as opposed to testing the waters and perhaps returning to college for another season. Brazdeikis is 20 years old, which might have factored into his decision. He's considered a second-round prospect for the NBA draft. In his only season playing under Beilein, Brazdeikis led the team with 14.8 points per game and chipped in 5.4 rebounds per game. He was one of the team's few reliable offensive options, shooting 46.2 percent from the floor and 39.2 percent from beyond the arc. "It was an amazing year for me in Ann Arbor," Brazdeikis said in a school release. "There are many things I still want to accomplish, and pursuing a professional career is just one of them. My family and I want to take full advantage of the opportunities to see where I fit in the NBA Draft. It's an exciting time, and I just cannot wait to get started." Mattews is also expected to remain in the draft after two years as a defensive star for the Wolverines. He averaged 12.2 points, 5 rebounds, 1.4 assists and 1.1 steals this season. "Many people have known about my desire to play professionally, and my family and I are blessed to begin that process again," Matthews said in a school release. "After gaining so much valuable information last year, I am looking forward to taking that next step. Everyone at Michigan holds a special place in my heart, especially coach Beilein and the staff. They have helped make this opportunity for me and my family, and I will always be thankful. The journey has only just begun." Michigan could also lose Poole, which would leave the team without its top three scorers. Last season, the Wolverines lost three of their top four scorers in Moritz Wagner, Muhammad Ali Abdur-Rahkman and Duncan Robinson. Poole averaged 12.8 points, 3 rebounds, 2.2 assists and 1.1 steals per game this season while shooting 36.9 percent from the 3-point line. "The last two years here at Michigan have been amazing and filled with so many memories," Poole said in a school release. "I've not only become a better player but a better individual. Being able to play in the NBA has always been my dream since I was young. I am confident that with my faith in God and hard work that I, and my family, are prepared to look at all options and make the right decision for the next step of my playing career." For an offensively challenged team, losing two of its best scoring options in Brazdeikis and Poole, in addition to Matthews, would be a major blow. Zavier Simpson and Jon Teske could be the only returning starters next season, with sixth man Isaiah Livers as the only other major contributor. Beilein's team won 30 games for the second straight season, finishing third in the Big Ten and advancing to a third-straight Sweet 16.